Fesenjan is a beloved Iranian pomegranate-walnut stew. It can be made with chicken, duck, or without meat. What you see above is a version made with mushrooms and chickpeas, a departure from the classic recipe. Note my greenery "garnish" isn't really edible 😉 This is my fast, 15 minute version of khorest fesenjan. Yes, you read right. 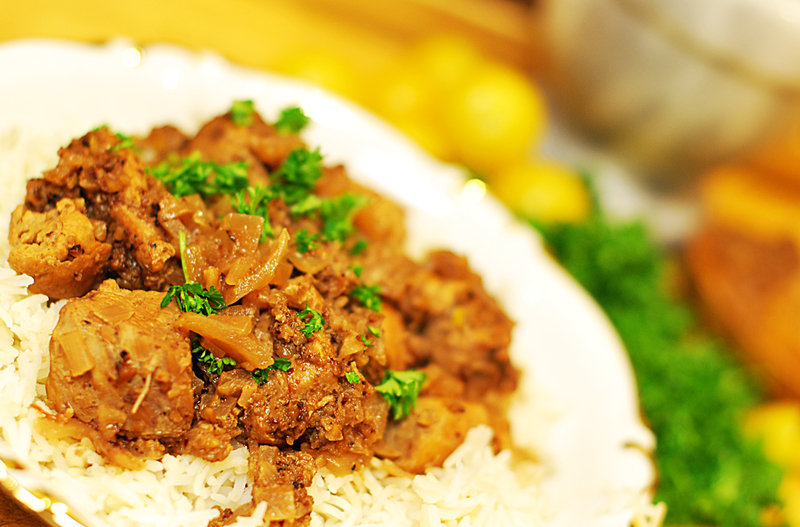 A 15-minute version of beloved Persian koresht fesenjan. For the uninitiated, it’s a stew of ground walnuts, pomegrante molasses, and, often, chicken. It has a sweet and sour flavor that might sound weird on paper, but tastes oh-so-good on the palate. It also has a bit of a reputation: a rep as something that takes a good while to cook. The classic, stovetop slow cooking version is here. A vegan version is here. But today’s offering is a quickie take on the slow-cooking classic. Over the weekend, a reader, Almaz, and I were chatting on Facebook. She loves the blog and had such kind words of encouragement for me. I was really touched. So I asked her if there was anything in particular she’d like me to post about. She jokingly (I think), said “15 minute fesenjan.” I immediately thought about a slow cooker version, that potentially could have only 15 minutes of hands on time. 1. Over a low heat, heat oil or butter in a Dutch oven. 2. As fat warms, dice onion. Add it to the pan and cook for about 5 minutes, stirring periodically. (Chopping the onion very small will help it cook through faster). 3. As the onion cooks, slice mushrooms (if using) and drain and rinse chickpeas (if using). 4. Lower the heat, and add walnuts to the onions. Toast walnuts lightly, turning often, for 30-60 seconds, or until you smell a hint of fragrance. Immediately add in spices, and cook for about 30 seconds more. Turn heat off. 5. Add in the pomegranate molasses/paste, stock or water. Stir well, then add in any of the following that you’re using: chicken, mushrooms, chickpeas. Put the heat back on, then increase heat to high until stew boils. Drop the heat down to low. 6. Cook for 5 minutes more, until mushrooms are cooked through and chicken, if using, is warmed through. (You can cook this dish longer if you wish, up to half an hour, but the shorter cooking time works if you’re in a hurry). 7. Adjust seasonings to your taste. If you want it sweeter, add in sweetener of choice, stir, taste. Repeat until you’ve reached your idea sweet-sour ratio. Serve over rice of choice and enjoy. Enjoy it over rice of your choice. A quick snap of the quick veggie curry I enjoyed for dinner recently. That being said, a little bit of curry never hurt anyone. So let’s take a detour, just for today. Today’s quick curry is fast, fresh, and useful. Useful? Yes, especially if you have an abundance of summer vegetables around and you’re wondering what the heck to do with them all. That’s exactly what happened to me recently. A friend hooked me up with not one, but two big batches of organic farmer’s market veggies. 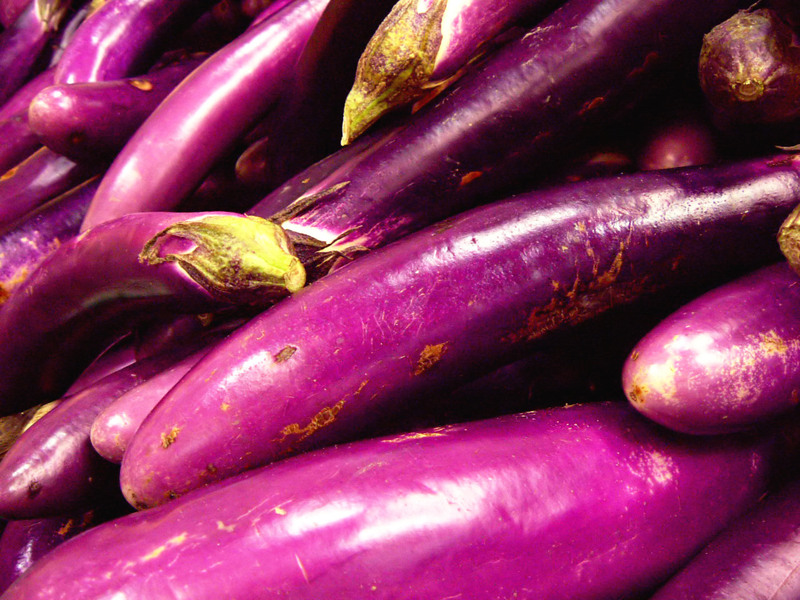 Verdant emerald zucchini, sunny yellow squash, lavender hued eggplants, ruby red sweet peppers, and more. I was grateful, excited, and nervous, all at the same time, because I wanted to make excellent use of the goodies, and not let anything go to waste. Eggplants were part of the haul of fresh summer produce gifted to me. I made a few dishes–grilled veggie subs, pesto with pasta and fresh veggies, chickpeas with, you guessed it, more of the fresh veggies. I dipped the raw veggies in hummus and smeared sunflower seed butter on them, too. Then one night, I was in a big hurry to get dinner on the table (who am I kidding–that’s every night!) I remembered a fast curry my friend Erica once showed me when I visited her in Florida. Coconut milk is the base of this simple curry. Feel free to get creative with the veggies, the spicing, and the garnishes. 1. Heat oil over a low heat in a large, deep skillet or Dutch oven. As oil heats, clean and chop all veggies into chunks. Leave the peels on if you like to save time and add fiber. 2. To the oil, add the onion pieces and fresh ginger. Cook to soften over the low heat for about 2 minutes. Then add in the curry spices of your choice, mix well and cook for another 30 seconds to 1 minute (you should smell the spices). 3. Immediately add in the coconut milk, veggies, and water. Stir thoroughly. Add in a bit of salt and bring to a boil. As soon as the curry begins to boil, drop the heat to low and cook for 2-5 minutes, until veggies reach the desired texture. (You can test veggies with a fork or knife). I don’t like mushy veggies, so I cook mine around 3 minutes. Depending on your preference, you may shorten or extend the cooking time. Taste, and adjust the seasoning. 4. Serve over cooked rice or other grain of your choice, with garnish if desired. Some garnish ideas: fresh cilantro, fried onions, raw scallions, a red hot sauce. 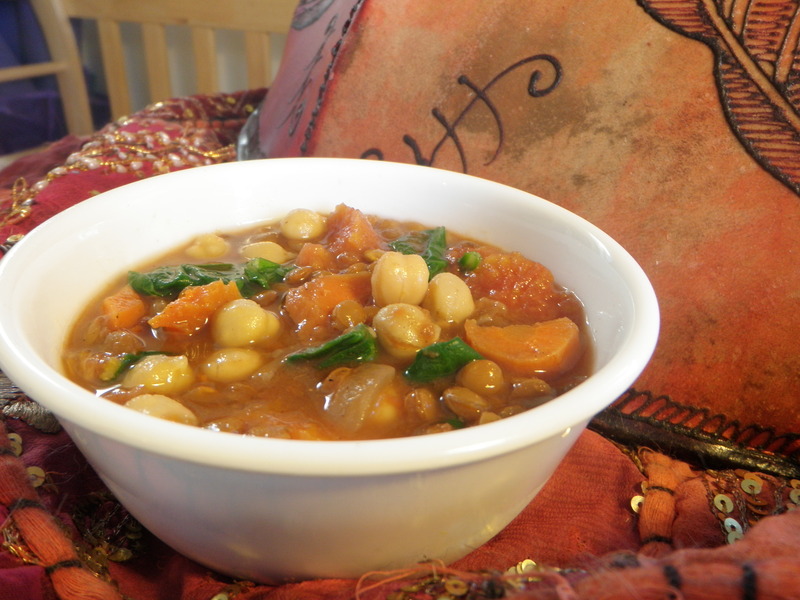 One pot lentil stew with chickpeas, spinach, carrots. My retreat Yogis loved it. It's easy to fix, and it tastes better after a day. Today’s recipe is one of the very first I got good at cooking, back in my teendom days. It’s simple, flavorful, and packed full of fiber, protein, iron, and B-vitamins, to name just a few. We’ve had some unseasonably cool days here recently, and settling down in the evening with a big bowl of this stew is oh-so-comforting. 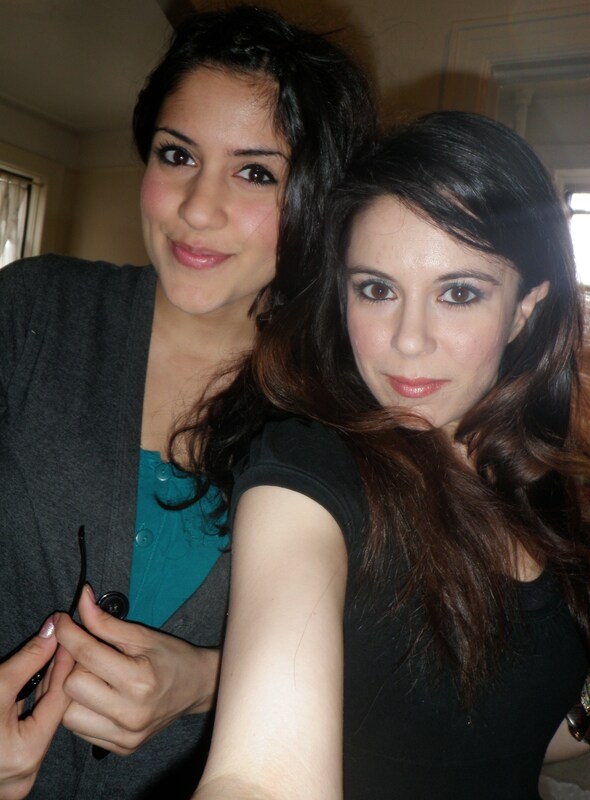 My sister, Mona, left, and I head out for a day of sightseeing and Yoga, with lentil and chickpea stew waiting for us at home upon our return. 1. Heat olive oil over a low flame in a large soup pot. As the oil heats, peel and chop the onions and carrots. 2. Raise the heat of the pan to medium. Add the onions and carrots and stir well to begin cooking them. Cook for about five minutes, stirring often, until softened. 3. Lower the flame to low. Add the garlic and spices and stir well. When the spices’ aroma begins to bloom (in about 30-60 seconds), remove the pan from heat immediately and turn off the heat. Cook for 30 seconds to one minute more. 4. Add the lentils, canned tomatoes, cinnamon stick, 1 teaspoon of salt, pepper and water to the pot. Break up the tomatoes and stir everything together really well. 5. Return pot to burner, and bring to a boil. Once stew is boiling, drop the flame down to low and cook for 20-30 minutes more, or until both carrots and lentils are tender. 6. Add the pre-cooked chickpeas. (If using canned, be sure to strain the liquid and rinse the chickpeas). 7. To finish, turn off the flame and add the spinach. The residual heat will wilt the spinach, leaving it a bright green color without overcooking it. 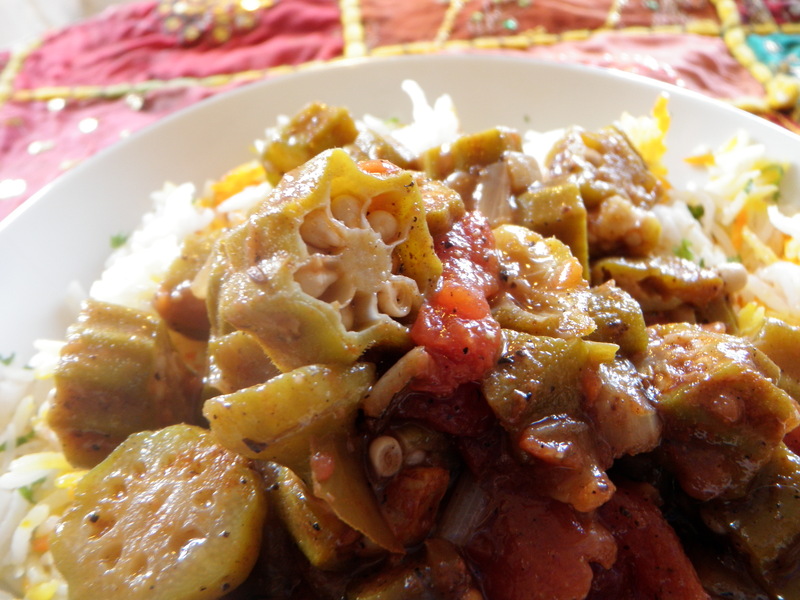 A simple Arabic-influenced okra stew quicky cookly when you use frozen, pre-chopped okra and ample spices. In Arabic they cal this bamiyeh. Hey guys! I’m finally back with a recipe post, as promised. 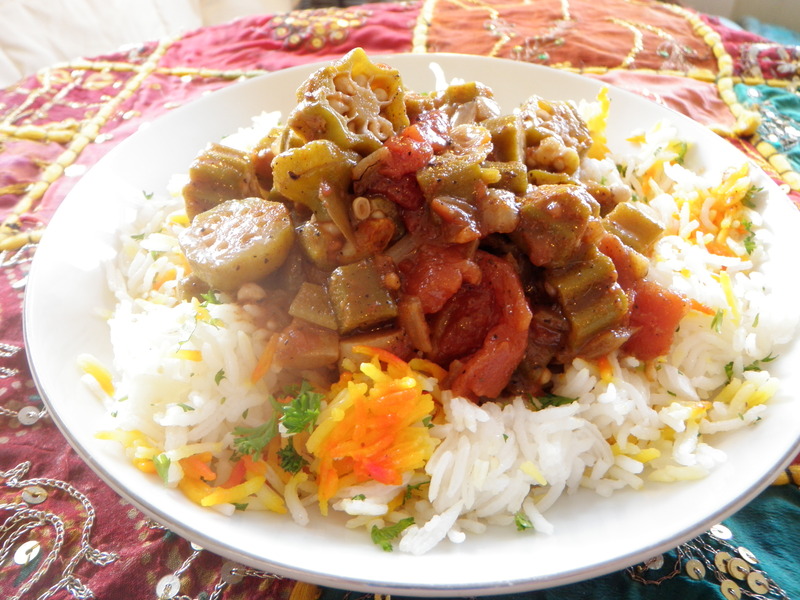 Today it’s a quick Arabic-inspired okra stew. Growing up in Texas, we used to always eat okra stir fried. Honestly, I don’t even know if this is the right term. All I know is that my mom would grab some emerald green pods from the garden, chop them into disks, and pan fry them with a bit of onion, tomato, oil and corn meal. Sometimes simple things are the best, and this okra method was no exception. Magically, the orka would take on a texture somewhere between crunchy and soft. It was never slimy, and so much healthier than the deep-fried okra so popular in the South. It wasn’t until moving away from home and doing some traveling in the Middle East that I was introduced to stewed okra. At first I didn’t think I’d like it–figured the slimy texture would put me off– but I was wrong. Stewed okra is just another way to love this versatile veggie. Especially over a big pile of basmati rice. Sign me up now, ya’ll! An Arabic spice blend and a tomatoey broth gives this stew a lovely flavor. Regarding okra, I used to be a bit of a purist. Only freshly picked pods from the garden (if we had one that year) for this girl. Farm stand okra is popular in Texas, and it would do in a pinch. If we did buy it from the regular grocery store, we’d always take our time to pick out the smallest, most flavorful pods. The bigger the pod, the higher the odds that it’d be tough and maybe even bitter. Now that I live in the big city, where gardens are in short supply and farmers’ markets in high demand, I’m a bit more flexible. Since okra’s technically not even in season yet, this time I took the plunge and bought a bag of frozen okra that had already been cut. It was on sale for $1.50. I wasn’t sure if I’d like the result of a quickie okra stew with Arabic spices, but I was pleasantly surprised. Now I’m wishing I’d bought a second bag of the frozen okra, so that I could play around with some different flavors. Next time for sure! 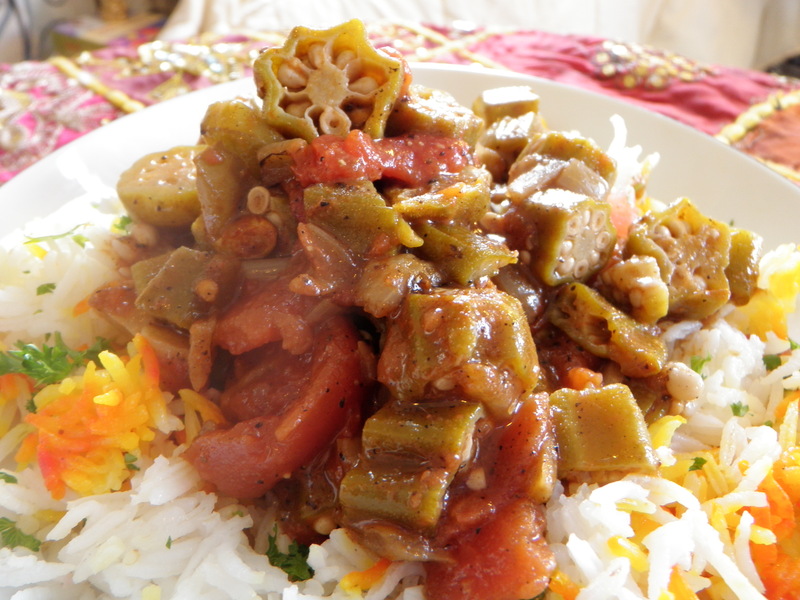 A closer view of this simple, fast Arabic Okra Stew. Arabic Spice Blend-a scant teaspoon each of powdered cumin, coriander, cardamom, allspice, nutmeg, cloves. Plus 1/2 teaspoon each of powdered cinnamon and ginger. 1. In a medium Dutch oven, heat olive oil over a low flame. 3. Add onion to oil, and cook over a medium low heat for five minutes. Add garlic and all spices, and cook for another 30 seconds to one minute, just until spices’ aroma starts to bloom. Turn off flame and remove from heat. 4. Add okra pods and tomatoes. If using who canned tomatoes, use the back of your cooking spoon or spatula to break them into pieces. Mix everything well. Add in about one cup of stock, and salt and pepper to taste. 5. Place back on the burner, crank up the heat to high, and get the mixture to a boil. As soon as it comes to a boil, drop down the heat and simmer ten minutes on a very low flame. After ten minutes, check the spices and tenderness of the okra. If you desire a more tender okra texture, continue to cook until that desired texture is reached, adding in stock or water as needed if the mixture starts to dry out. 6. Serve over basmati rice and enjoy! Khorest Fesenjan, a classic Persian chicken dish with a sauce made of pomegranate and toasted walnut. Photo by Stacey Young. Hey guys! We recently explored a vegetarian (actually vegan) version of today’s Persian dish, Khoresht Fesejan. Today, here’s the more classic version of this luxurious Persian stew with pomegranate, walnuts, and chicken. Enjoy this dish on top of the delicious rice dish of your choice. Classic chelo rice would work beautifully, or you could try my super easy basmati rice technique. Enjoy this richly flavored, slightly sweet, slightly sour stew. Note: Since pomegranate juice is so popular now and pretty easy to find in supermarkets, you can use that instead of pomegranate syrup. However, pomegranate syrup/molasses is available in some grocery stores, and also in Middle Eastern/Mediterranean stores. A lot of oil will come to the top of the dish. This is normal and nothing to worry about; it is the oil from the walnuts. 1. Heat the fat in a large pan Dutch oven over medium heat. Add the onion and cook until tender, about 10-15 minutes. Remove onions. 2. Salt chicken. Add chicken and brown on both sides, about three minutes per side. Remove from pan, and set aside. 3. 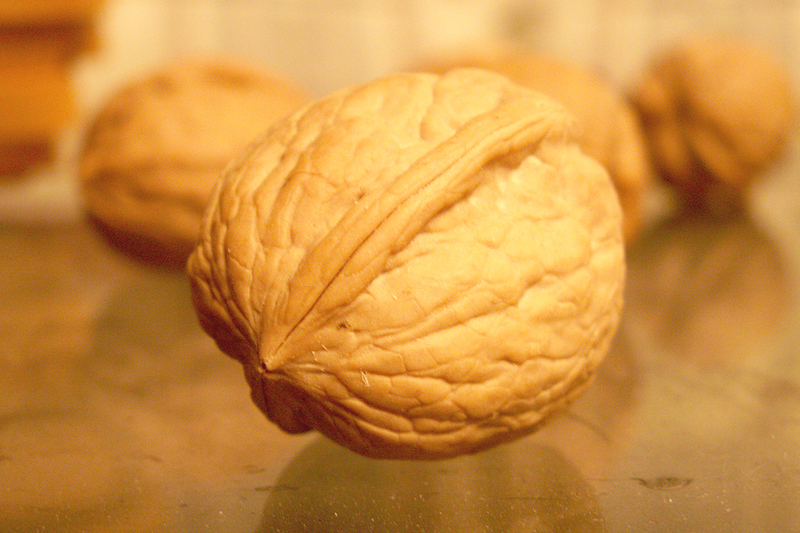 Place the ground walnuts in the remaining oil in the frying pan. Cook and stir over low heat 5 to 10 minutes or until lightly browned. 4. Return the onion and chicken to the frying pan with the walnuts. Stir in the pomegranate juice or diluted pomegranate syrup. Reduce heat to low, cover, and simmer 20 to 30 minutes, stirring occasionally, until chicken is no longer pink and juices run clear. (You can simmer longer to deepen the flavor, adding water as necessary so the pan doesn’t dry out). 5. Adjust seasoning to taste. If stew tastes too sour, add a little honey or sugar and simmer a bit longer. Serve over basmati rice. Makes 4 to 6 servings. The lively, warm, and rich flavors of pomegranate and walnuts seemed like a perfect way to send winter packing. Koresht fesenjan combines those flavors and more. It’s actually a dish I discovered as an adult. I read about it in a book, “Guests of the Sheik,” did some research, and eventually came up with a version of it that’s pretty traditional, but with a couple of my personal tweaks. It’s become a favorite! In a stroke of dumb stroke of luck: I recently had everything on hand to make this koresht fesenjan except for the meat (typically chicken or duck is used.) Grinding the walnuts is usually the most tedious part of this recipe for me, so I was thrilled that I had some pre-ground walnuts on hand. I wasn’t in the mood to rush out and buy meat, and anyways, I’m always down with a good vegetarian meal. 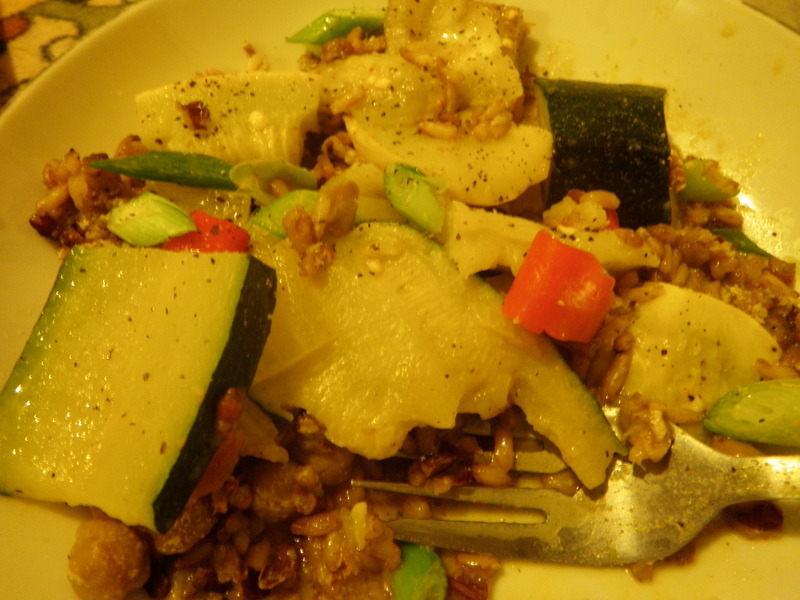 I remembered butternut squash being part of the recipe in a version of this dish byNajmieh Batmanglij. Madame Najmieh? She’s kind of the Queen of Persian Cooking, by the way. She literally wrote the book on it. Several, actually. So I figure that if butternut squash is good enough for her, it’s good enough for me! And this would be my chance to finally explore a vegan version of this lovely dish, something I’d been meaning to do. So in the butternut squash went, along with some leftover sliced mushrooms I had on hand from another night’s salad. (Yes, the mushrooms were my addition, and I admit I felt nervous as I tossed them in. No need. The stew turned out great and the mushrooms absorbed the other flavors beautifully). This recipe calls for pomegranate syrup or juice. Since pomegranate juice is so popular now and pretty easy to find in supermarkets, you can use that instead of pomegranate syrup. However, pomegranate syrup/molasses is available in some regular grocery stores, and also in Middle Eastern/Mediterranean stores. Another thing: A lot of oil will come to the top of the dish. This is normal and nothing to worry about; it is the oil from the walnuts. And walnut oil is good fat. Anti-inflammatory and great for the heart and the skin, as a matter of fact. 1. Heat the oil in a large pan Dutch oven over medium heat. Add the onion and cook until tender, about 10-15 minutes. Add mushrooms and cook 5 minutes more. Remove onions and mushrooms. 2. Place the ground walnuts in the remaining oil in the frying pan over low heat. Cook and stir 5 to 10 minutes or until lightly browned. If using optional spices, add now and allow to cook for 30 seconds or until fragrant. 3. Return the onion to the frying pan with the walnuts. 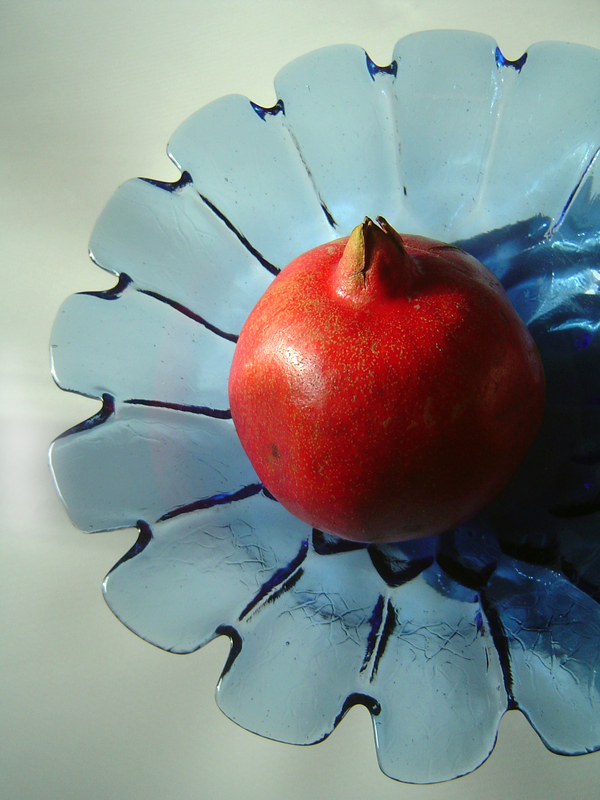 Stir in the pomegranate juice or diluted pomegranate syrup. Reduce heat to low, cover, and simmer 20 minutes, stirring occasionally. Adjust seasoning to taste. If stew tastes too sour, add a little honey or sugar. 4. Serve over basmati rice. Makes 4 to 6 servings. An almost accidental stew. Turkey, tamarind-date paste, and some root veggies simmered together to form lovely, deep flavors. Sitting atop a jazzed up cauliflower puree. Originally, I wanted to make this stew with organic lamb, but organic turkey was on sale, so I got that instead. You can make the Tamarind Date Turkey stew in a slow cooker or on the stovetop. It's super easy and flavorful either way. Vegetarianize it by leaving out the meat and increasing the mushroom content. Sometimes random things inspire my cooking. Often enough, it’s a combo of simply using what’s in the pantry and/or fridge, finding an ingredient on sale, and getting a bit creative. This Tamarind Date Turkey stew came about when I had a jar of tamarind chutney laying about after a dinner party. I’m the queen of use-it-up (I hate to waste!) Of course, I also adhere to my mom’s rule “When in doubt, throw it out.” 😉 So don’t worry, we eat safely at my house. I figured it’d be easy enough to give this stew a Middle Eastern flair, and that’s just what I did. It turned out richly flavorful–quite hearty and satisfying. Yet not greasy or heavy, if that makes any sense. That’s how I like to cook in these colder months–food with oomph, but not anything that’s gonna drag you down. 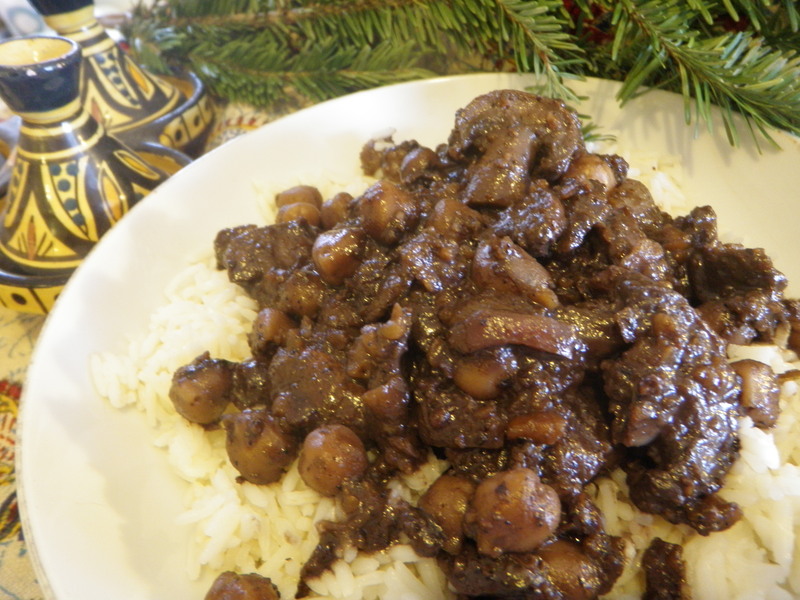 Speaking of which–my original intention was to make this stew with lamb chunks, not with turkey. But when I got to Whole Foods to buy some organic lamb, organic turkey was on sale. In the spirit of being flexible, and budget-minded, I opted for some lovely turkey thighs. 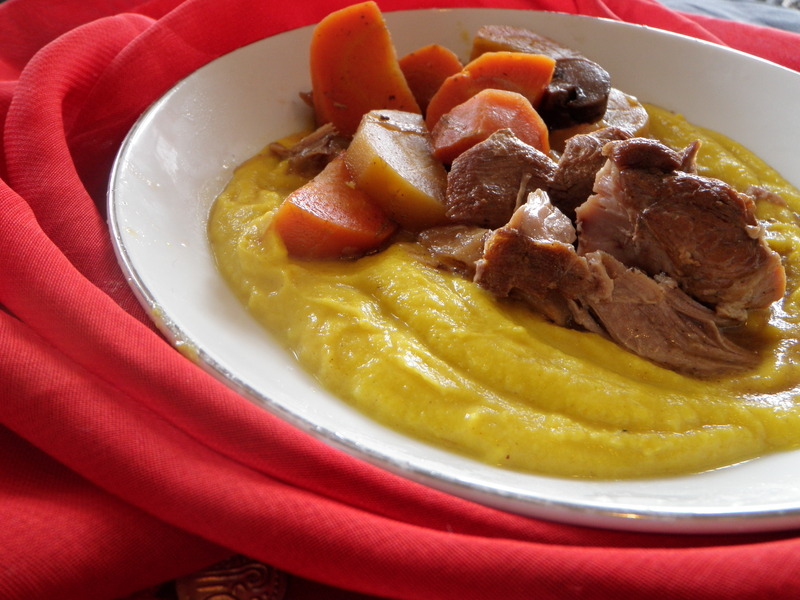 The lamb version of this stew can be posted another day. Tamarind is a pretty interesting ingredient. It grows in pods, and its pulp (edible) has a sour flavor with a hint of sweetness. It’s popular not just in Middle Eastern cookery, but in the cuisines of South Asia, Thailand, and in Latin America, to name but a few. So if you’re not sure where you can find tamarind, try your local Middle Eastern, Latin or Asian mart. Or look for an interesting tamarind chutney in the grocery store. 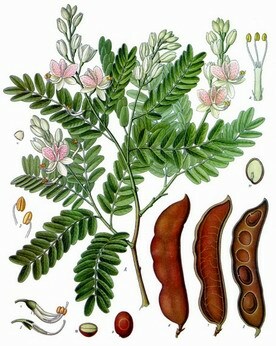 Tamarind can benefit the body in numerous ways. It’s high in vitamin C as well as B vitamins. It can aid in digestion and has a mildly laxative effect. Gargling it can ease a sore throat. It’s anti-inflammatory when applied topically to the skin. 1. In a large Dutch oven, heat oil over medium heat until shimmery. Season turkey thighs with salt and pepper, and brown in the oil, approximately four minutes per side. Make sure both sides of the meat have good color. As the turkey sears, peel and then slice the onion into half moons. If you have extra time, begin peeling the root vegetables and cutting them into large, uniform chunks. 2. Remove turkey from pot, and set aside. Add the onions, and cook for 3 minutes, adding water as necessary to deglaze pan. Continue cutting root vegetables as the onions cook. Add the spices and garlic to the onions, stir, and cook for another 30 seconds to one minute, until their aromas start to rise. 3. Remove pan from heat. At this point, if you’re using a slow cooker, all of the ingredients go into the slow cooker. However, if you opt to make this on the stovetop, you scrape any brown bits from the bottom of the pot, and then add everything into the pot. 4. If using the slow cooker, cook for a minimum of 4 hours on high, or up to 8 hours on low. If you’re cooking on the stovetop, bring the stew to a boil, then bump it down to a slow, gentle simmer and cook for an hour or more. Add water as needed if the sauce starts to get too thick. 1. Add cauliflower florets to the water in a large pasta pot. Add salt and stir. Bring to a boil, then drop down to a slow boil for 15 minutes, or until florets are fork tender. 2. Drain and remove florets from the heat. 3. LET COOL until you could handle them with your bare hands if you wanted to. Not that you’d want to, but it’s seriously important to LET THEM COOL. Not doing so could bust your blender or food processor. No joke! 4. Add cooled florets, 1/4 cup of water, oil or butter (if using) and curry powder to a blender or food processor. Let it all whir away until well-mixed into a smooth puree. Check seasoning and adjust salt, pepper, and curry powder to your taste, re-blending as needed. Nowruz Mubarak and Spring Fling Yoga!